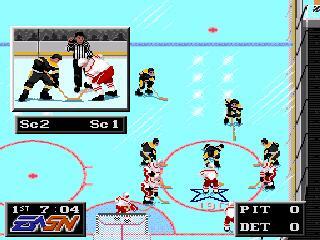 NHLPA Hockey ’93 is the second game in the franchise, and the follow-up to 1991’s NHL Hockey. The game was renamed to reflect the addition of actual player names instead of just using their numbers. While this is a welcome addition, EA apparently felt that they could only afford to pay for one license, so with the addition of player names comes the subtraction of team names and logos. Like the previous game, it is not possible to play a complete season and the player is still left with the choice of playing either a single game, a 7-game playoff series, or a complete playoff season. New this year however is the addition of a battery back-up, eliminating the old password-based system. Probably the biggest change I noticed playing this game is the feel of playing with a bad team. While a poor team can move around the ice at a decent pace, the lines fatigue faster and the AI seems a bit dumber, which is a more realistic representation of a bad hockey team. I also complained about the frequency of fights, which has been lessened to about 1 per match up in this release, but there is still no way to completely turn it off. The ability to edit lines is a welcome addition to the game, and the edited lines are saved along with the game data during a playoff run. The line fatigue meter which appeared at the top of the screen in NHL Hockey has been taken out, which is a shame because it was a helpful way of knowing when it was time to make a change. My biggest problem with NHL Hockey was the bad AI, and if improvements were made for this game, I can’t tell. The passing game is spotty, as my passes often bounce off of my teammates’ back. Additionally, if you are foolish enough to play with off sides turned on, your teammates will regularly skate into the zone ahead of you and are in no hurry to clear the zone if there is a neutral zone turnover. Buy NHLPA Hockey ’93 on GameGavel or Amazon. Tagged genesis, Hockey, NHLPA Hockey '93, Review, sega, Sports. Bookmark the permalink.